The Taurus symbol is accompanied by a green aventurine gemstone in these earrings made with both silver-plated and silver-filled components; approximate length is 4 cms (~1.57 inches). Taurus is the second astrological sign in the Zodiac and green aventurine is one of Taurus gemstones. If your Sun sign or your Rising sign is Taurus, you may feel attracted by green aventurine and you will certainly benefit from its energy (this can also happen if you have various planetary points in Taurus or a dominant planet in that sign). 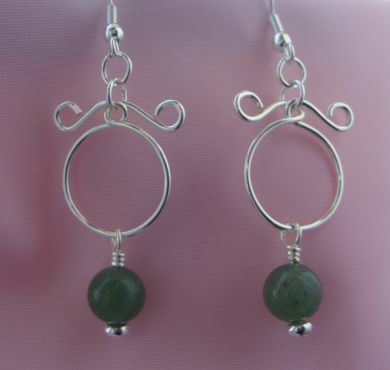 Green aventurine is said to keep you grounded while giving you perspective so you do not get stuck with only the concrete aspects of a situation.